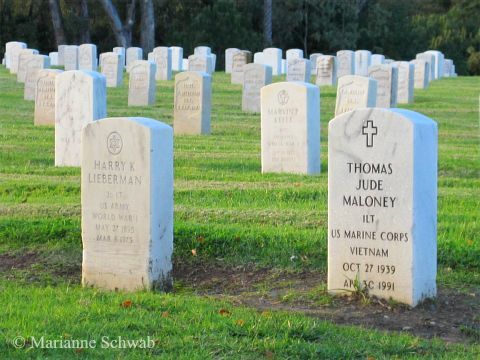 We all think of the Arlington National Cemetery located near our nation's capital, but many folks who live on the West Coast don't realize that there is a national cemetery located on this side of the country. The Los Angeles National Cemetery is easy to miss. 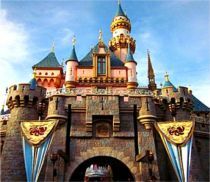 It's located north of Wilshire Boulevard off the 405 freeway but not really visible unless you drive along South Sepulveda Boulevard. I've lived in L.A. for over 20 years and only recently made a point of stopping by and paying my respects to those soldiers who have served our great country. You'll find a granite obelisk situated in the San Juan Hill area of the cemetery. It was erected In Memory of the Men Who Offered Their Lives in Defense of Their Country. 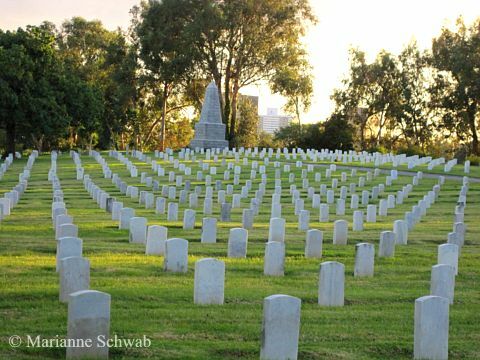 The Los Angeles National Cemetery was originally just 20 acres but has grown to more than 114 acres since its late 19th century origins and began as a cemetery for the Pacific Branch National Home for Disabled Volunteer Soldiers, the only National Home located west of the Rocky Mountains. Opened in 1888, the home was dedicated to caring for disabled Union veterans of the Civil War and the land on the eastern edge of the property was set aside for use as a cemetery. The Los Angeles National Cemetery is the final resting place for soldiers who were killed in action and veterans who returned back to the U.S. after serving our country to enjoy the freedom they fought for overseas. I was touched by so many of the graves for America's most recent casualties of the Iraq war. When I returned from my visit, I wanted to find out more about Marine Lance Cpl. Jose Gutierrez. Jose Gutierrez was an orphan on the streets of Guatemala City who heard about America from the minister at a children's shelter. At the age of 14, he made his way to California by walking and jumping freight trains. Once in California, he was brought up in foster homes. He joined the Marines to make money for college and to send to his sister in Guatemala. 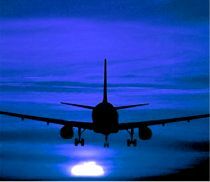 He wrote a letter to his foster mother on March 1st and said, "Pray for all of us, not just me." According to U.S. military officials, Jose Gutierrez was the first combat casualty of the war in Iraq and was killed in action on March 21, 2003 when he was just 22 years old. He was from Lomita, California, and assigned to the 2nd Battalion, 1st Marine Regiment, 1st Marine Division, Camp Pendleton, California. Those close to him recently set up a Facebook Memorial Page for him. Please join me in paying respects to Jose. For many of us not personally touched by losing family or friends in recent military actions, putting a face on the fallen makes us pause to appreciate the sacrifice of U.S. soldiers. 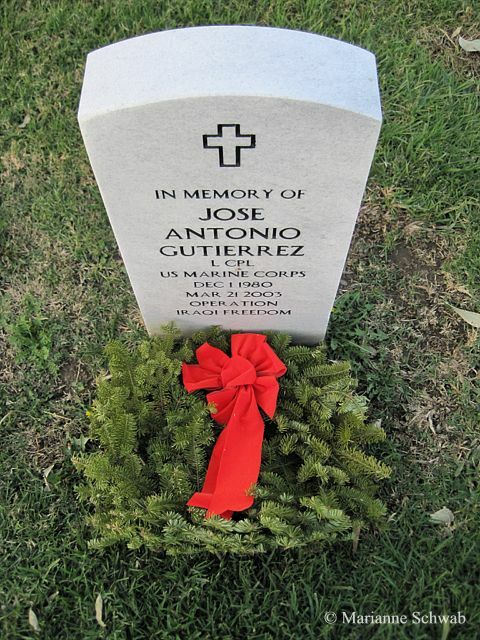 You can sponsor a wreath to place on the grave of a fallen soldier at Wreaths Across America. 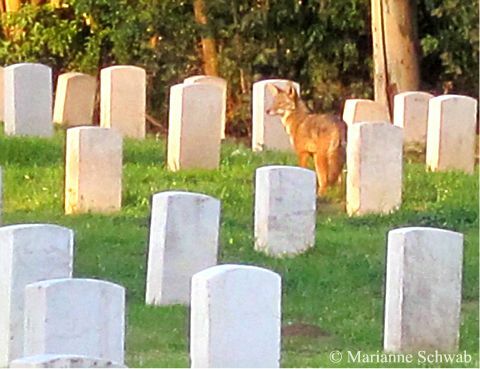 I suppose it's appropriate that during my visit to the cemetery that I saw a lone Coyote roaming among the graves. You see, there are a couple of unusual burials that distinguish Los Angeles National Cemetery. Two dogs are interred here: Old Bonus, who was an adopted pet of residents in the soldiers’ home, and Blackout, who was a war dog wounded in the Pacific during World War II. Old Bonus and Blackout’s burials are exceptions for national cemeteries since the burial of pets or animals is now prohibited. 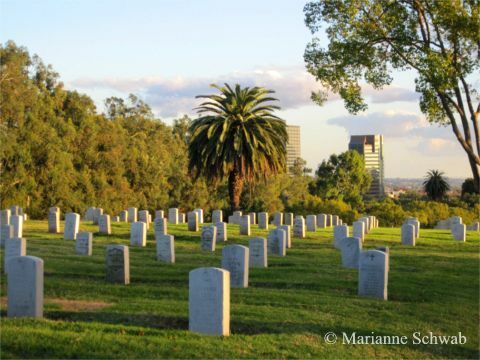 You don't need to wait until Memorial Day or Veteran's Day to visit the Los Angeles National Cemetery. It's appropriate to pay our respects to all the brave men and women who have put their precious lives on the line for securing the freedom we enjoy in these United States every day of the week. Location: Los Angeles National Cemetery, 950 South Sepulveda Blvd, Los Angeles, California. 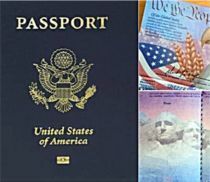 Hours: Open daily, 8:00 a.m. to 5:00 p.m. except Memorial Day 8:00 a.m. to 7:00 p.m.